DO NOT mirror a full unaltered download anywhere else. I don't want any confusion as to where the latest version can be found. This includes modpacks. If you've got your heart set on it, ASK FIRST. FEEL FREE to redistribute individual files, altered or unaltered, within your own mods, with credit for what you took and a link back. FEEL FREE to frankenstein parts of my mod into your own, with credit for what you took and a link back. If you do so I would appreciate if you send me a link letting me know. DO NOT use any of these assets in downloads that will be offered for money. 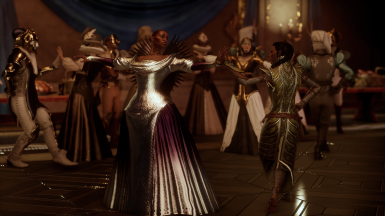 Replace Grand Duchess Florianne with Vivienne so your Inquisitor can have a dance. Found under Optional Files. This started out as a mod request on the forums and once I started working on it I promptly got carried away. 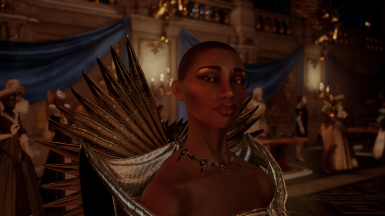 A semi-random assortment of mods affecting Wicked Eyes and Wicked Hearts. If you recruit an optional party member (i.e. not the starting party) and then ditch them later, they will still appear in Halamshiral as if nothing has happened. 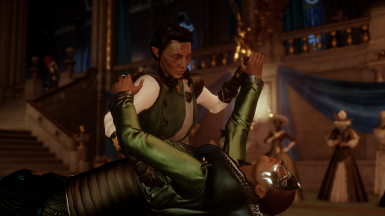 For immersion I recommend either 1) don't recruit party members you don't intend to keep or 2) wait until after WEWH to kick them out. This has been fixed in UPDATE v1.2 but that is only available in Frosty format. The above does not apply to the final scene with your love interest, however, so don't expect any touching reunions if you hit it and then quit it. This should be installed before entering the ballroom for the first time or it will not work as expected. Apparently that weird pause in the middle of Varric's introduction is supposed to contain applause, but as that never played for me once, I've removed it. If you are a fan of awkward pauses I've added some fun new ones, though! See below. Same as above, kicked out party members are still treated as being present. 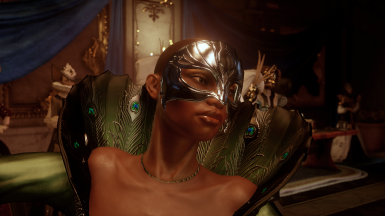 Cassandra "Get On With It" Pentaghast and Sera's audio will be replaced with a silent pause if they are not in your active party, as otherwise I don't think they are loaded in that scene. I assume the announcer has to pause for breath and take a moment to process what he just said out loud, respectively, but your mileage may vary. Turns out Varric actually did give the Inquisitor a nickname, but I don't think the lines ever play normally. 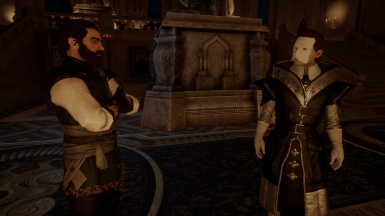 It looks like they may have at one point intended to track the Inquisitor's disposition like they did Hawke's but that didn't happen -- but this is pure speculation. Merge with the latest version of DAI Mod Manager or Frosty Mod Manager.